Dr. Adrian Malja Dentist & Othodontist in Bucerias offers a full range of dental services for residents and visitors from the Sayulita area to Puerto Vallarta. Dr. Malja and his staff have over 25 years of experience. You can rest assured you will always have professional and friendly service at our office. Don't let dental problems spoil your Sayulita vacation. After a visit to Dr. Malja, you will find yourself back to the beach, enjoying yout vacation. All dental and orthodontal services are offered for residents and visitors to Puerto Vallarta, Bucerias, Bay of Banderas, and Sayulita area. Dentistry doesn't have to be a frightening experience. If you are looking for quality care, a friendly staff and a relaxed atmosphere, then you have found the place. It is our staff's number one priority to ensure you have the best dental experience at our office. 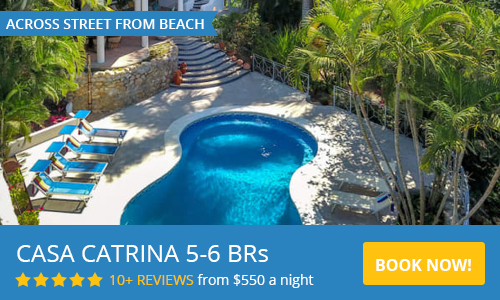 We are located at the CMQ Hospital, Calle Javier Mina and Hwy 200 in Bucerias, just 25 minutes from Sayulita. (2nd light into Bucerias if coming from Puerto Vallarta). We offer implants this summer for only $1,200 USD (includes crown) and Crowns at $360 USD. Get a 20% discount on all treatments, except root canals, dental cleanings, crowns and implants. My husband is a retired Dentist and he is very impressed with Dr Adrian. I was petrified of Dentist and fortunately I have good teeth. Dr Adrian and his staff are extremely gracious and calming for someone like me. I have had cleaning, and implant & crown. Extremely pleased with Dr Adrian. Have referred him to a few people in the area. I have been seeing Doctor Malja for the last 4 years and after one implant, 2 crowns and a multitude of fillings I want to say what a wonderful job he did. All the work was painless. I got phone calls after my procedure to make sure I was all right. Also I get the best cleaning I ever got from his wife Claudia. Highly recommend both. My name is Dr. Donald Greenleaf and I am a retired dentist from the state of Washington, now residing nine months of the year in Bucerias, Mexico. I received my dental degree from the University of Oregon Dental School (now Oregon Health Sciences Center) in 1966 and practiced as a general dentist in Lakewood, Washington for twenty-nine years. My wife and I have been living in the Bucerias area for the past nine years and during that time I have had occasion to visit the office of Dr. Adrian M. Malja for treatment on three occasions, each involving multiple appointments. The first was to remove decay from a tooth that had broken because of the underlying decay. As I was one week from returning home I requested that a temporary filling be placed. This temporary lasted without problem until I was able to see my dentist at home and he remarked at how thoroughly the decay had been removed. The second appointment was to replace a small gold inlay that had fallen out after thirty years and again, my regular dentist was very impressed with the fit of the restoration. The third visit was because of pain due to an abscess on a lower molar and Dr. Malja prescribed an antibiotic that relieved the pain in just four days and then accomplished a very difficult (because of my age the canals are quite calcified) root canal followed by placement of a gold crown. The first and third appointments involved lower teeth and Dr. Malja achieved profound anesthesia with just one completely painless injection. I was also impressed by the professional attitude of the staff, the cleanliness of the office and the rigorous adherence to sterile procedures. I also found Dr. Malja to be very gentle and concerned with the condition of the patient, stopping frequently to ask about my comfort. I most certainly will return to his office if I should require any further dental treatment and would not hesitate to send any of my family or friends there. A last minute, two week vacation to Bucerias, gave me a change to see Dr. Adrian dental clinic. I made an appointment online and walked in the day after our arrival. I was seen by Dr. Emma Sevilla. Excellent, very precise and very patient with me. First appointment was for cleaning. Second appointment was on Saturday, starting procedure for replacement of two existing crowns . When I came home my wife was amazed and impressed. Than third appointment to place the new crowns. It took a while to get them correctly placed and we spend quite some time to get the ‘bite’ correct. Dr. Emma was patient and did not rest until she was happy. Upon her insisting I did have to come back the next day for check up. Some minor adjustment were made and I was out of the door in 15 minutes. My Canadian dentist was not in favour of me/us doing dental work done in Mexico. Well, all I can say is that I am going back in October to have the older molars with fillings done and have two more crowns placed. The cost of the 2 crowns were higher than normal due to the available time. In general I can confirm that the cost saving, having all of this done in Mexico, paid for my holiday. Settling the bill can be in cash or by credit card. I would recommend the cash option as you will be charged 3% extra for using a credit card. Dr. Emma, you were in one word: FANTASTIC, thank you so much!!!!!! For Dr Adrian, our compliments for your hospitality, patience and good advice for future treatment options. My husband and I both had our teeth cleaned while on vacation & were very satisfied with the process. We would have no problem having major work done by Dr. Adrian. Also made us realize how our dentists here in Alberta are over charging for the work they provide for patients. The cost savings paid for my trip! I would like to thank Adrian and all his staff for their friendly courteous service. Over the last 2 visits I have had 4 crowns and found their service both professional and timely. I had big and complex dental issues as diagnosed by a periodontist and my regular dentist in the USA. I was referred to Dr. Malja by friends that had used him. Dr. Malja’s diagnosis of my dental issues was exactly what had been diagnosed by my Periodontist and regular dentist in the US. Dr. Malja restored over 10 teeth with individual Crowns, Caps, one bridge, and one cantilever… maximizing use of “tooth space”. He also has performed root canal with less trauma than you typically would believe. His professionalism is complemented by the friendliness and competence of his staff. Importantly, Dr. Malja continues to update and stay current with developments in the Dentistry field. This not only goes for his knowledge …but also with materials used. The best testimony I can give about Dr. Malja … is that both my wife and I have been his patients for over ten years… and seek him out each year we visit Bucerias for checkups and any dental work required. Adrian speaks English and provides translation for Spanish Modismos. Adrian gets extremely busy .. so set up your schedule early during you visit or preferably before. Hopefully, Adrian will continue his practice of pricing his services inexpensively, so we can continue to enjoy our “Dental Vacations” with the savings. 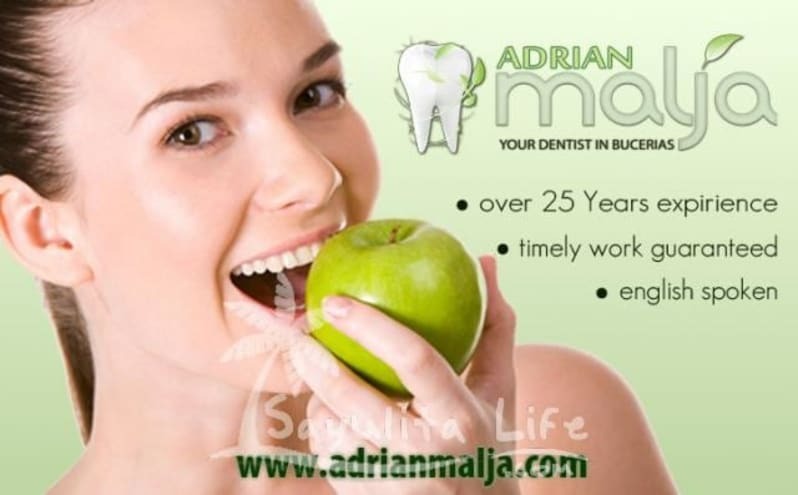 I can highly recommend the services of Dr. Adrian Malja. It was 1 year ago when I first visited his office asking for the best option to improve my quality of life which was greatly affected because of my dental problems. The best option was to extract all my teeth and replace them with porcelain implants. My teeth look now very nice and natural, I am very happy with the results. I thank Dr. Adrian and his attentive staff and I would also like to mention that their facilities and equipment are the best. His staff always treated me with the best care, respect and professionalism. The prices are very affordable and compared with the U.S. or Canada up to 50% lower. If I could make a score for this dental office I would give 100 on quality, professionalism, care and kindness. My first visit to see Adrian was 3 years ago, I had lost a filling from one of my front teeth and was in pain. Through a friends recommendation, I called Adrian and he saw me before his office opened the next morning. I was nervous. I know that those needles for front teeth, make my eyes run, my nose run, and it feels like the needle is going up through to my eye ball. I know that those needles “normally” hurt. I don’t know what Adrian did, but I had almost no pain and definitely no tears. We talked about veneers, crowns, and implants. Adrian gave me four options and I decided to go with the full crowns, implants, and a sinus lift. By the way Adrian’s quote was less than a quarter of what I was quoted for similar work in Canada. Last year I decided to go for it. Not only do I have a beautiful smile, but I have teeth that now fill my mouth. I was cursed with small teeth and somehow Adrian managed to have larger crowns made for me that fill my mouth and look just terrific. I can go on and on about the great service and the family feel of his business. However, the best I can say is that I have complete confidence in his abilities and those of his staff and would not hesitate to recommend him to friends and family. Your entire family can be treated with us. We address problems ranging from bad breath, bleeding gums, and toothaches to gum disease and tooth decay. All of our services, from general dentistry and hygiene to advanced corrective procedures, benefit both children and adults. Dr. Malja continually researches and reviews independent studies – that is, studies that do not accept funding from biased sources – choosing the materials and treatments that will perform the best for patients of any age. Av. Heroes de Nacozari 280, Bucerías, 63732 Riviera Nayarit, Nay.